I think I'm the tardiest person ever in posting their own birthday photos. I celebrated my 21st birthday on 25th May - 5 days after my actual birthday - with some of my closest friends whom I've grown up with from primary school to JC, and of course some of my good friends whom I've met after I've started blogging. 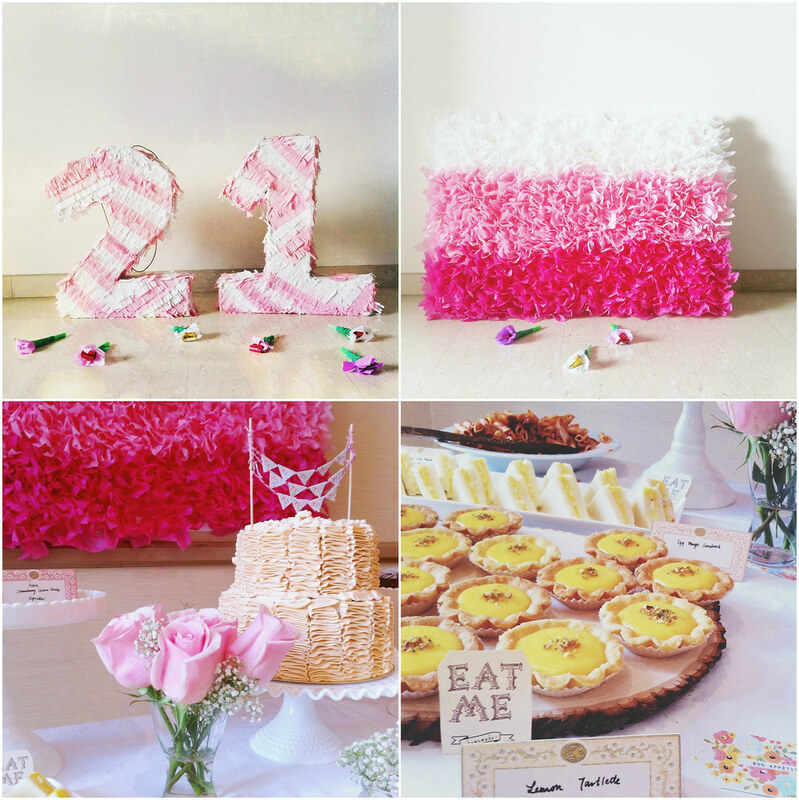 I know I hardly post very personal photos on my blog, but I hope my experience in planning my 21st party will give all other girls celebrating their own 21st much help! 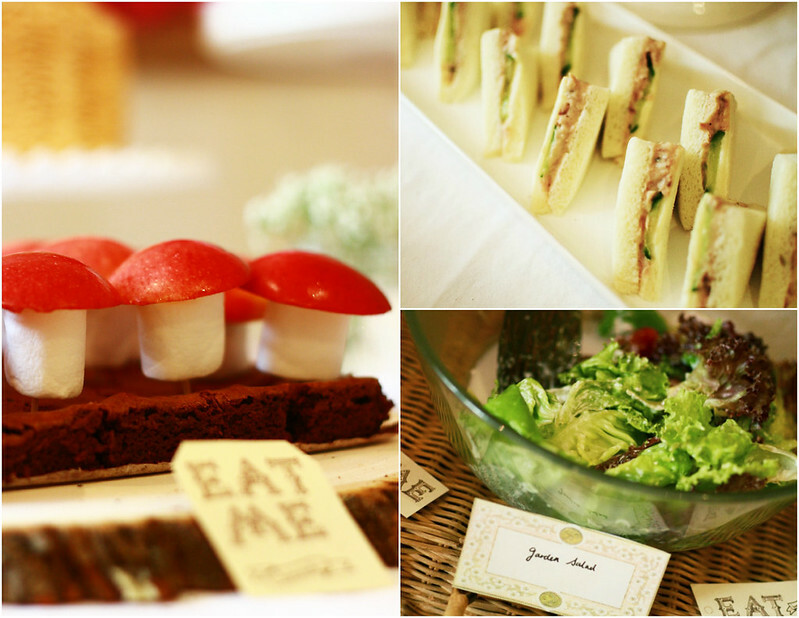 In this very belated post, I'd show you how I planned for my 21st birthday party, from the food down the very last details of decor. All the decor from my party was DIY, and I have included a link of everything in the post below. Originally, I wanted an Alice in Wonderland theme, but it proved to be too difficult to obtain the themed materials for the party. So I opted for a Whimsical 21st Tea Party instead, with a garden and floral elements. I held my party in my friend Shane's condo function room - that's huge cost savings for venue, since renting the premises only cost me $20 for 5 hours, as the management wasn't very strict about timings. If you have the budget for a venue that can better fit your theme, such as a pub, cafe or restaurant, then go for it! But the quotes I have obtained from most F&B premises is at least $1,000, sometimes inclusive of very basic food, and they usually require you to purchase ALL food and beverages from them for the exclusive use of the premises for 2-3 hours. My hanging giant pom poms! Because I am on a budget, I DIY'ed all the decor on my own. Base your decor on the major elements first, ie decor that will span the whole room, such as streamers, banners, big balloons, hanging decor and other eyecatching big elements. I had 5 floral pompoms made by my talented friend, Melissa, from crepe paper. These are really easy to make and immediately adds an oomph to the party decor. 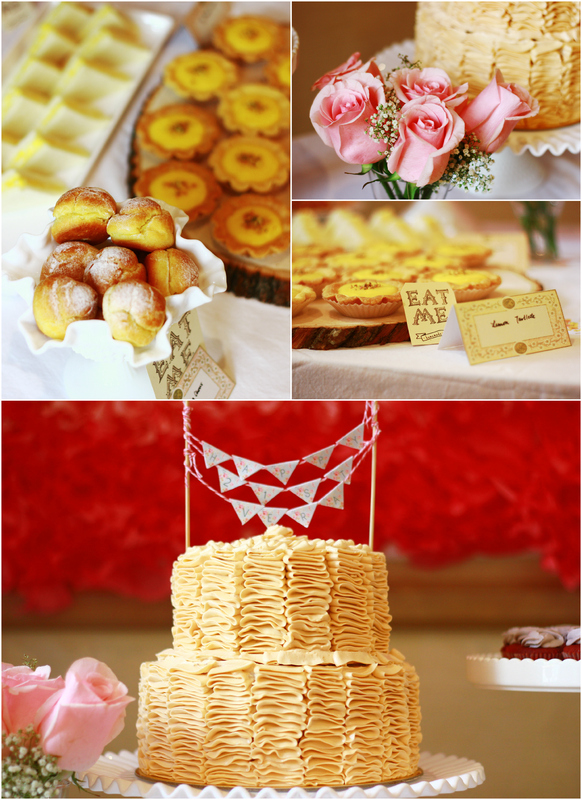 These were supplemented with a crepe flower gradient backdrop for the dessert table. 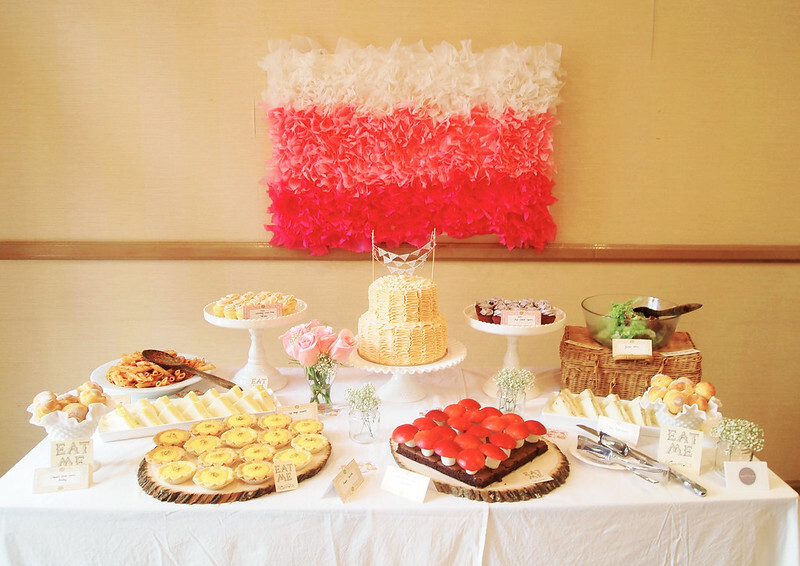 I feel that it's important to have a backdrop for the dessert table as food usually takes centerplace in guests' photos and having a backdrop just makes everything much more presentable. 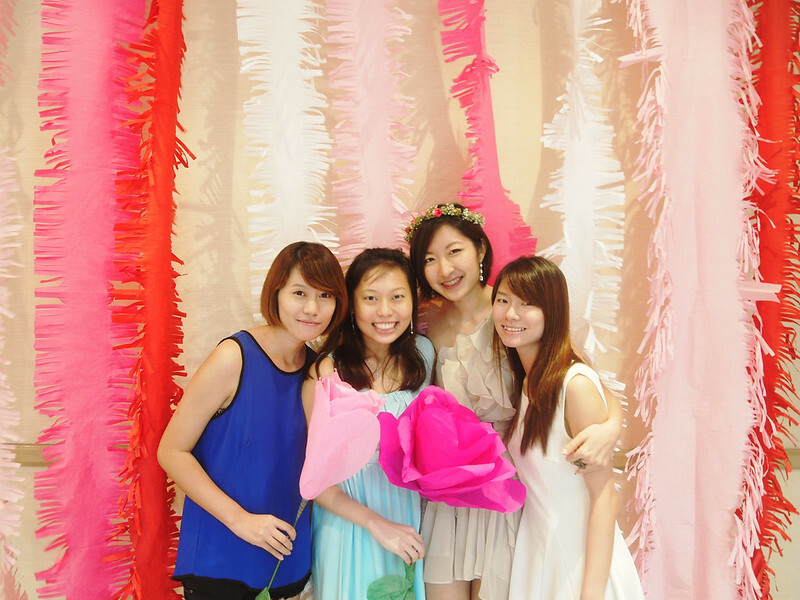 The last big element in my decor was a huge big fringe garland backdrop for photobooth purposes! 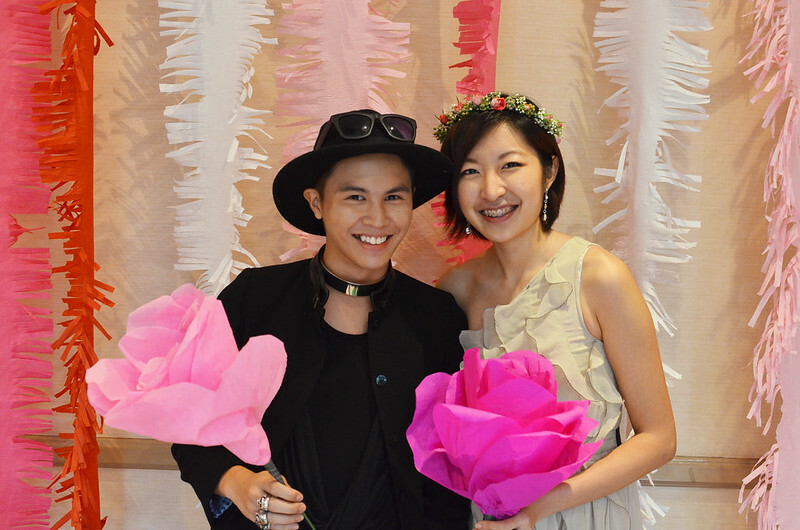 What's a proper party without a photobooth station, right? This tutorial by Oh Happy Day made creating a backdrop easy peasy and saved me much time, as you just have to take sturdy crepe paper fold them multiple times lengthwise and cut both sides into thin strips. For the smaller details, I had made two pinata in the shape of "2" and "1". This was very very time consuming because of the crepe paper fringe which I had to painstakingly stick layer by layer onto the cardboard structure. I also made some simple photobooth props in the form of giant crepe paper roses for add some whimsy to my themed party and these served as really fun props to have around with guests during the party! To keep guests entertained and also to serve as a party favor, again my dear friend Melissa made some flower party blowers. All materials were purchased from Artfriend, and costed me about $83 in total, but I still have quite a bit of excess material leftover. I was really really pleased because a lot of my guests told me that the food and food table setup was some of the prettiest that they've seen! 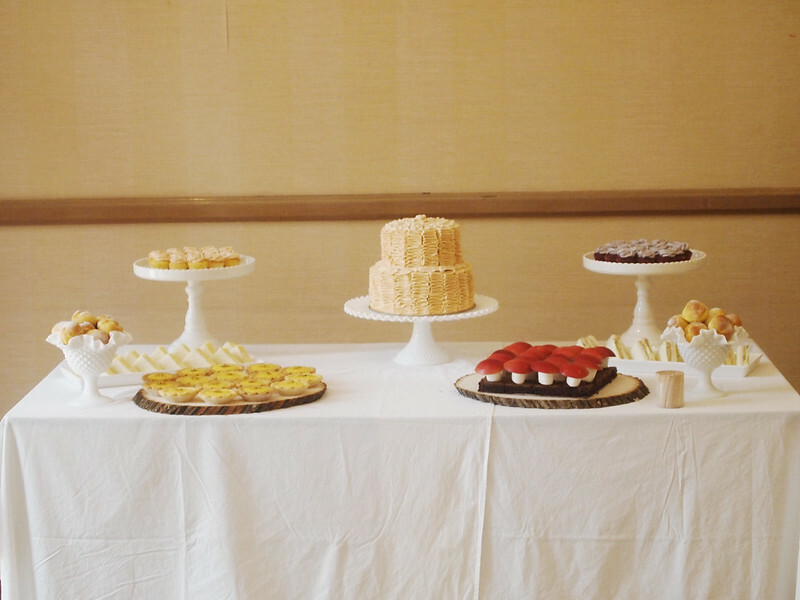 This was really thanks to Valene, from Smitten Micro Bakery, who has painstakingly put in much effort into ensuring that my dessert table look impeccable.Valene and her husband was there an hour early to help with the setup and they came after the party to clear away the homeware. I ordered Lemon Tarts, Fudgy Chocolate Brownies, Red Velvet Mini Cupcakes, Strawberry Cream Cheese Mini Cupcakes, Vanilla bean Cream Puffs, Tuna and Egg Mayo Finger Sandwiches and a huge two-tiered ruffled icing birthday cake from Smitten Micro Bakery. I also made my own mushroom tomato penne paste, and a garden salad. I would really seriously recommend the fudgy chocolate brownies - it wasn't overly sweet, but was very chocolatey and had a thick, chewy consistency. The lemon tarts (or any other flavoured tarts for that matter) was very good too - the lemon curd was just slightly tangy and the tart shell had the right bite of crunch in it. The ruffled icing cake also stole the limelight as it was very pretty to look at and tasted really good too! Smitten can customize the birthday cake's look and flavor according to your fancy liberally and the price was very reasonable too, at just over $100. You can notice that there are "toadstools" growing out from the fudgy chocolate brownies - that's my idea to add to the whimsical element of the party! 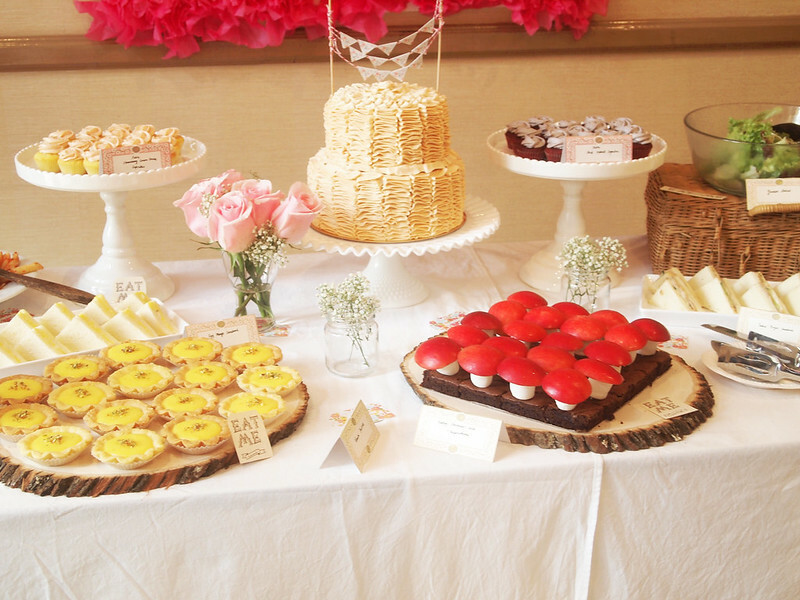 The toadstools were made by stacking a sliced apple and a marshmallow on top of the brownies, secured by a toothpick. 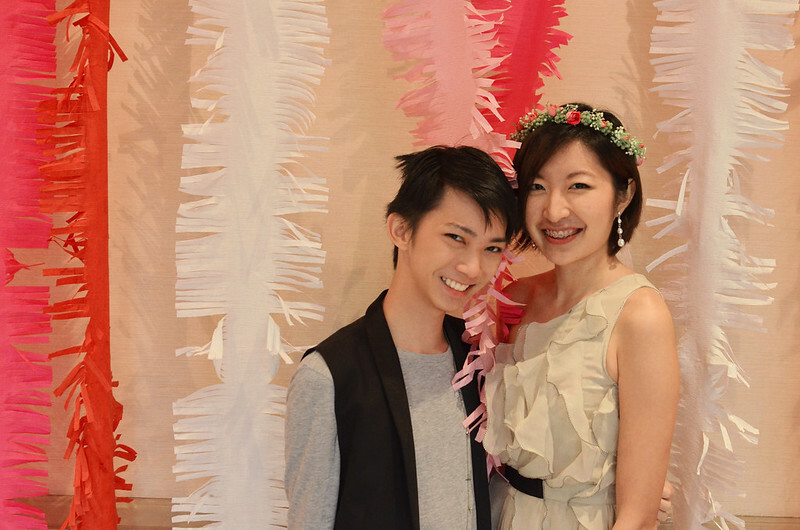 With dear Shane, who helped me book his function room! Unfortunately, I didn't have much time to plan for entertainment for my guests, nor was I able to secure a music player! I felt that I wasn't a very good host in that aspect, as I wasn't able to cater to all my guests adequately. So I would recommend you to organize some fun games that can allow your guests to mingle. Perhaps you can also hire a photographer, or guilt-trip your friend/brother/boyfriend into being the photographer of the day, then buy or printout a bunch of silly photobooth props and leave your guests to entertain themselves! Hahaha. 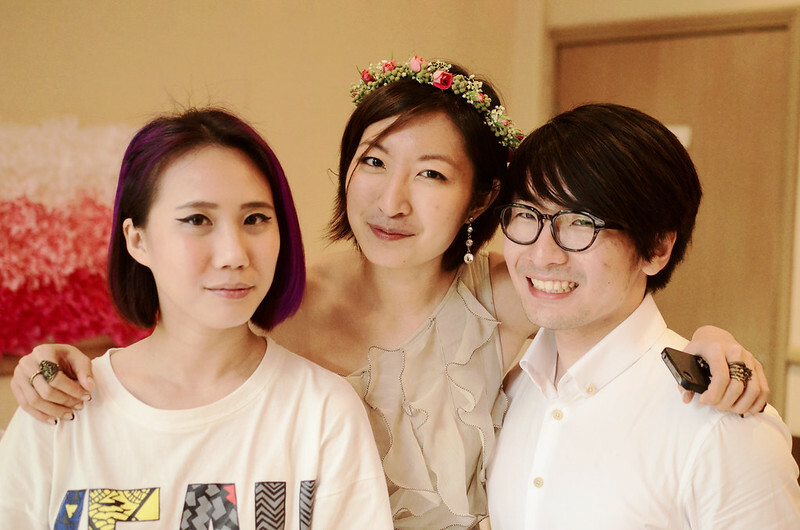 Check Daiso first before purchasing from Artfriend! I only realized after my party that Daiso sells a lot of craft materials and some of them are much cheaper compared to Artfriend, since everything's priced at $2. Plan some games and activities for your guests to mingle around so that they won't get bored! Google online - there are literally HUNDREDS of printable tags and other materials that you can make use of as your party decor and Pinterest also served as a very good source of inspiration for you to become your own party planner. 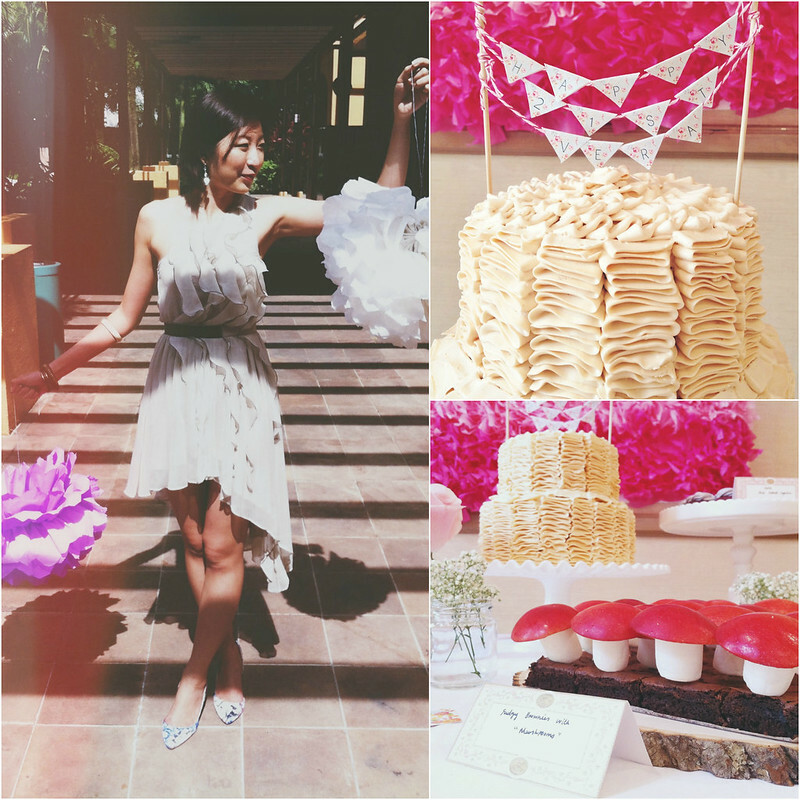 Some good blogs include Oh Happy Day, Eat Drink Chic, Ruffled, Sweet Thing and of course, Martha Stewart. The bottomline is - to have a beautiful setup for your birthday, you definitely need to pay attention to details - such as the color themes, the printable tags, the background decor, positioning and style of the florals and cutlery. PS. I'm selling the "21" pinata! Filled with sweets, confetti and covered lovingly with pink and white fringe crepe paper, can be hung from the ceiling. Buy it for 1-year olds, 2-year olds, 12-year olds or 21-year olds! PPS. More photos available on Naked Glory Facebook page here. 21st seems like such a long time ago for me.. haha! Anyway, Happy belated birthday, Vera! The setup is really gorgeous! May i know where you get all your cake stands from? They're so pretty! Love the toadstool idea! Brilliant! Hi! Are you still selling the "21" pinata? How much are you selling it at? Regarding the gradient backdrop, where did you get the colored tissue papers? Hey! This is like a perfect birthday party for a 21-year-old. I have also booked a very beautiful event space NYC for my daughter’s birthday, I can now take ideas from this blog to make her day a special one and I am sure she will love it!